In addition, Zuckerberg testified that the company plans on doubling its content safety and security staff to “20,000” by year end. Envision IP analyzed Facebook’s U.S. patent portfolio to understand how the company has patented various aspects of its data security and user privacy technology. According to our analysis, the company owns 3,579 issued U.S. patents, and another 2,263 published U.S. patent applications. Of these, a total of 252 patents and 155 published patent applications relate to user privacy and data security technology. The company’s patenting, and presumably R&D focus in these areas, appear to have traditionally been on user privacy, which comprise 209 issued U.S. patents, versus 43 issued U.S. patents related to data security. Of these 223 patents, 207 (~82%) were originally filed-for by Facebook, indicating that these are organic technologies developed by Facebook specifically for its platform and services. In addition, US 7,669,123, entitled “Dynamically providing a news feed about a user of a social network”, and which lists Mark Zuckerberg as a co-inventor, has claims reciting: “A system for displaying a news feed comprising….a privacy component configured to limit access to the plurality of news items to a set of viewing users…” The patent was filed in 2005, and has 331 forward citations. 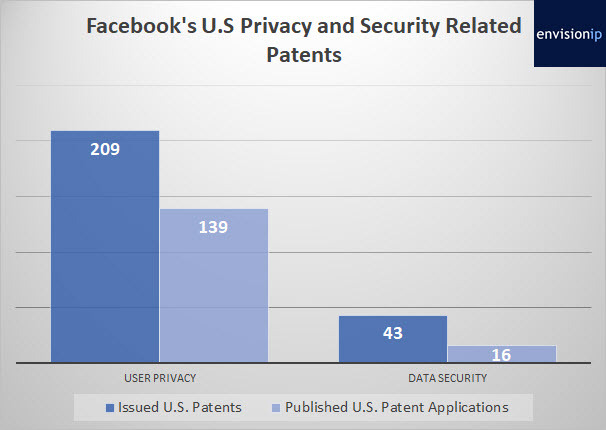 The 252 privacy and security related patents represent 7% of Facebook’s overall U.S. patent portfolio. In isolation, this number does not reveal much. 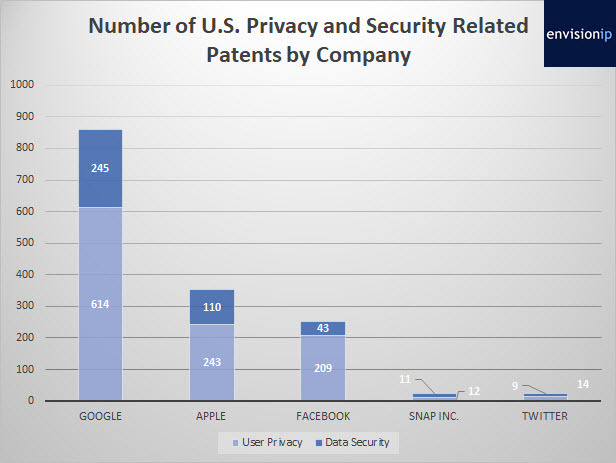 However, we compared Facebook’s privacy and security-related patents to the U.S. patent portfolios of Google, Apple, Twitter, and Snap. In terms of sheer numbers, Google dominates the group with 859 patents related to user privacy and data security, followed by Apple with 353 patents related to the same. It is important to note however that Google and Apple each have U.S. patent portfolios with well over 20,000 patents each, while Facebook, Twitter, and Snap only have a fraction of that. Twitter currently owns 1027 U.S. patents, and Snap owns only 69 U.S. patents. As a percentage of their overall portfolios designated to user privacy and data security, Snap’s portfolio is heavily focused on user privacy and data security, with 33%. While Snap and Twitter each have 23 patents in these areas, these patents only make up 2% of Twitter’s 1027 U.S. patents. Google and Apple fall behind Facebook in terms of percentages of their overall portfolio dedicated to user privacy and data security, with only 2% and 4%, respectively. Snap’s patents in these areas focus on privacy controls related to third-party and out-of-network viewing of images within the Snap platform, as well as security features related to messaging. 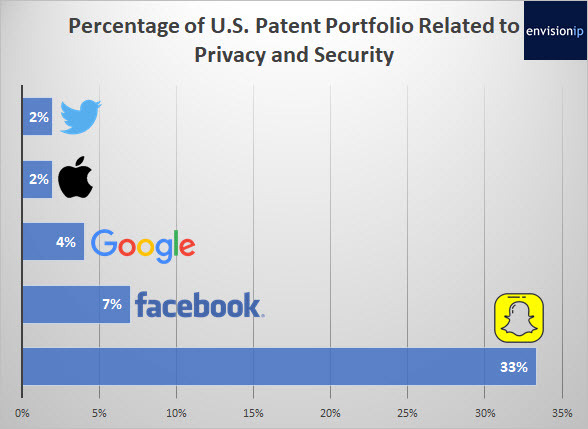 Snap only owns 66 issued U.S. patents, suggesting that as its patent portfolio grows, the percentage of patents related to user privacy and data security may decrease if the company focuses R&D on other areas of its platform. Overall, it may be difficult to compare the patent portfolios of these companies given the large disparity in sizes. However, given that Facebook has a relatively large patent portfolio, as compared to Snap and Twitter, its 7% weighting of patents related to user privacy and data security does indicate that the company has invested significant R&D and legal intellectual property costs in these areas. Given the recent breach, and Facebook’s statements regarding a heightened focus on user privacy and security, we expect the company’s patents in this area to grow. In addition, we expect its competitors in the social media and networking space to also increase patenting efforts in these areas. It will be interesting to see how these companies approach patenting and R&D on their platforms going forward. Given the recent events at Facebook, we may see a shift, and continuing trend, towards a heightened patenting focus on user privacy and data security, versus traditional patenting of product features and monetization technologies. It is also important to note that while Facebook and others have patented technology related to various aspects of privacy controls, this does not necessarily means that these companies have actually implemented or commercialized these technologies into their products and platforms.